This 2 bedroomed apartment (1 double, 2 singles) and sofabed is fully equipped with microwave oven, (No conventional oven), dishwasher, hob and fridge. Also included are 2 separate bathrooms, 1 with shower and 1 with bath. There is a TV and free WI-FI included. There is free use of swimming pool and Jacuzzi. 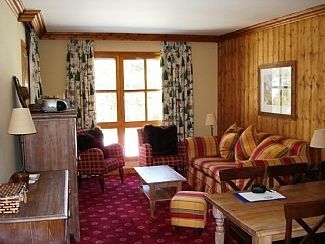 The accommodation is ski in-ski out, has a balcony with views down the slopes and access within minutes to the ski lifts. The ski school is literally 15m from the reception of the block. ARC 1950 village has several restaurants, a bakery, grocery store, bars and a club. Our apartment is privately owned, It is available for short or long term lets in either the summer or winter. Bedroom two has 2 single beds and bathroom opposite with shower. In the living room there is a table and chairs that accommodates 6 persons along with storage space. The apartment has TV, free Wi-Fi , separate sofa chairs and a sofabed which folds out as a double bed. The kitchen has a fridge/freezer, hob, microwave oven and dishwasher. Arc 1950 is a Ski in-ski out with a modern ski lift network which provides access to 425km of the Paradiski ski domain with levels to suit beginners and experiences skiers. There are many ski hire shops at the resort, along with 2 dedicated lockers, with combo locks for ski equipment safe keeping. Ther is a golf course at Arc 1800 which is a free 10 minute bus ride from the resort. Notes on accommodation: The resort is family friendly and very suitable for children. The resort is car free. There is a car park under the resort which provides quick access to the apartment (There is an additional cost for the car park)The Baby's cot and high chairs are available on request (there is an additional cost for cots and high chairs) There is a 24 hour reception and free Wi-Fi Internet access in the apartment. Outside: The car park and slopes are literally 1 minute from the apartment. The swimming pool, heated (indoor and outdoor - same pool) are 2 minutes from the apartment. Ski hire shops and ski pass office and lessons are all within 1 minute of apartment. Utility Room: The washing machine in on the same floor in a separate room, this includes a dryer too which is all free of charge. Cleaning / Towels / Linen / Maid service: The apartment rental includes clean linen and towel change which will be supplied before arrival. If two week rental is required the apartment will be cleaned, towels and linen exchanged during your stay. The resort has entertainment within the resort during Winter and Summer for families and children. In the summer there are several lakes for fishing, paragliding opportunities close by, White water rafting and mountain biking. Mountain bikes can be hired at the resort and the cable cars are available for transport with bikes to the peaks. Arc 1950 is a pleasant location if you like the outdoor life, enjoy walking, cycling or any other outdoor activities. Ther is no beach close by. You would need to drive to the South of France to get to the closest beach. Driving to ARC 1950 from the UK? From Calais to ARC 1950 the distance is approx 937km (approx 9 hours). Le Havre to ARC 1950 880km (approx 8 hours). Zeebrugge to ARC 1950 955km (approx 9 hours). Annecy Airport to ARC 1950 110km (approx 1 hour 50 mins). Geneva Airport to ARC 1950 170km (approx 2 hour 15 mins). Lyon Airport to ARC 1950 220km (approx 2 hour 30 mins). Chambery Airport to ARC 1950 115km (approx 1 hour 15 mins). Bourg St Maurice is the nearest town which is approx 30 minutes by car or you can get the Mountain train (Funicular) from Arc 1800 which takes you into Bourg St Maurice. The train operates in the Ski season and Summer. There are shops within Arc 1950 resort, such as a bakery, Spar general store, wine specialists etc. There is a choice of restaurants at the resort, such as Italian, French, take away snack bars and crepes etc. Booking Notes: We send out a booking form and ask for 25% deposit at time of booking. The balance will be requested 6 weeks before your arrival date. A £250 breakages deposit will also be requested. This is fully refundable subject to no major damage. Changeover Day: We run the bookings from Saturday to Saturday. The time you are requested to depart is before 12:00 on the Saturday. The earliest you can enter the apartment on arrival is 16:00, this is to allow for time to clean and replace linen/towels. Notes on prices: Prices are for the property per week in UK Pounds. The weeks run from first night of stay Saturday and last night of stay Friday night depart on Saturday morning.